The Twisted Stitcher: "They like me. They really like me..."
"They like me. They really like me..."
*Champion and Reserve Champion in Framed Cross Stitch Class! That means I was #1 and #2 top entries!!! 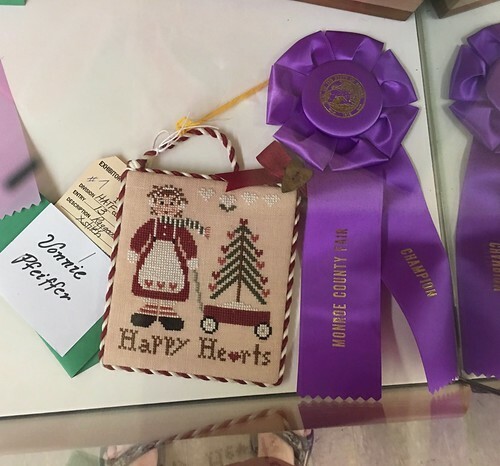 *Champion means I was #1 top of Christmas Needlework Class Entries! was a VERY successful Fair Showing. VERY successful. I am really quite amazed, shocked, speechless, really. Its all sort of surreal, to be honest. This is my 11th consecutive year of showing at the fair and as my long-time followers/readers know...I've taken my lumps and hard-knocks over the years. But you know what?! those lumps and hard-knocks did everything to instill in me that I needed to practice, practice, practice to become the BEST stitcher I could be. 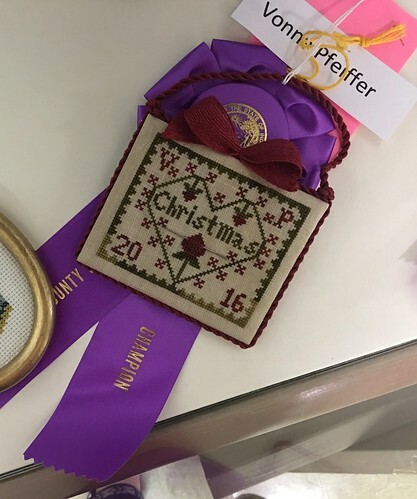 Now that I have won Grand Champion...my ultimate dream, finally came true...I know with great affirmation of my heart...I STILL am not the accomplished stitcher I want to be. I have room for more growth, more perfection. And this year's success just instills in my heart a greater thirst, a greater yearning to practice MORE and try, try again next year! overall, this year's entries into my county fair were a bit more scanty than they've been in previous years. All over the fair, not just Needle Arts. 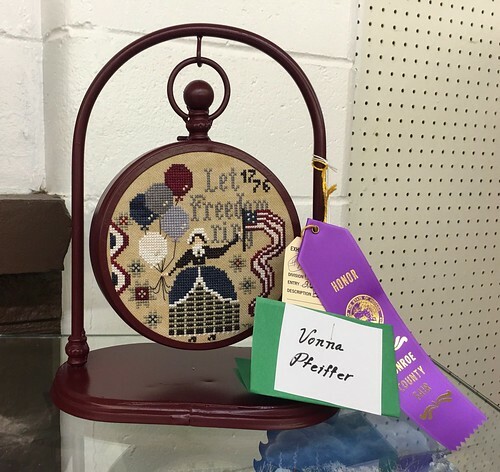 IF you are a crafter (of any kind) I highly, highly, highly recommend that you look into your area and the shows/fairs/places you may enter your work - whatever that may be. Share your love of arts! Share it for the next generations to view and want to learn more about it! The arts are dying. No matter what that handwork is: painting, drawing, photography, baking, crochet, knitting, sewing, quilting, vegetable growing, flowers, whatever...it's not being done like it was when I was a child! And when I talk to people my own age, what do I hear? I don't have time for that. You're silly to devote that much time to those sorts of things. What will people do with that once you are gone? THAT in my opinion is silly to think of creating in that way. What do I get out of my cross stitching? I get satisfaction of knowing what my two hands create beautifies my home, makes it homey, warm, lived in. I know that my children, will cherish my cross stitch and if after they are gone it is what it is. Entering into my local fair has been one of the best things in my life. Sure, it hurt my feelings at times to read comments left for my pieces. Think about it....it's your baby. You took care of it, fed it, dressed it all up and took it to the fair and when you hear your baby isn't the prettiest baby there and in fact some of your baby is not right...well...that hurts! But in the end...it will put in your heart the desire to grow another baby and this may be THE baby that wins the contest. I was so stinkin' proud of my baby yesterday! And one day I hope to have the experience again! Because let's face...feeling this proud about something makes you want to feel it again! SMILE because God loves you and so do I! Spread kindness - the more you spread, the bigger the ripple effect! I am so thrilled for you, dear Vonna. 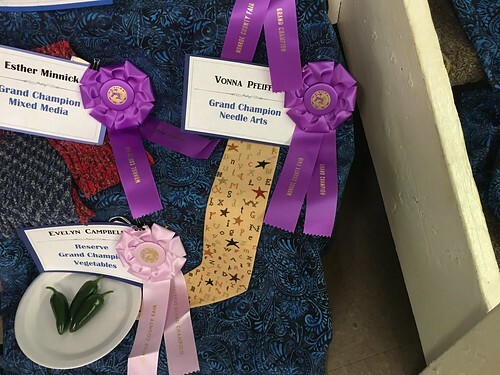 Congratulations on your ribbons and your wins especially the Grand Champion of Needle Arts! I know how hard you have worked for this over the past years along with the disappointments. Good luck to you and your cookies. 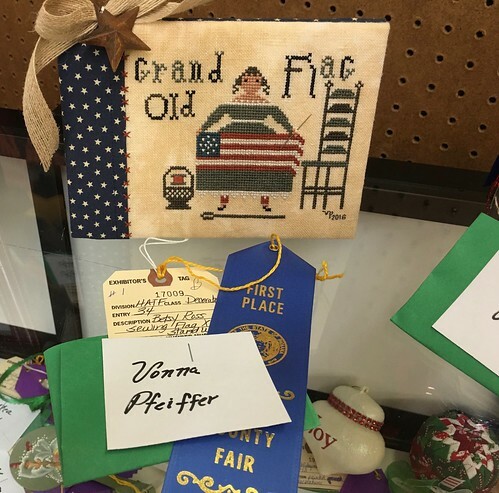 Our County Fair was held the 12th through 15th and I agree with your assessment; the entries in the needle arts division were very few. Again, well done your fair accomplishments! Congratulations on doing so well, it is richly deserved, your stitching is stunning. You also made the latest cross stitch crazy as the featured blog. Oh Vonna, I am so happy and proud for you. I remember your video from last year and how much you wanted these awards. I think you are amazingly brave to put yourself out there. You certainly deserve every accolade. Vonna - what a life lesson you have given your children. They've watched you stitch with love these past years, and they've seen your disappointment. Yet you had the desire and the mettle and the talent, and it all paid off this year. We are thrilled for you, and proud, too. And I'll bet those cookies will be winners as well. Enjoy your moment in the sun. I am so happy for you. It is always nice to be recognized for your efforts. Great job Vonna! It's work and love all in one! I. Am with you! Vonna - Congratulations! That is SUPER! You always do such beautiful work - happy to see you are rewarded. Yes, Sally, they really DO like you! 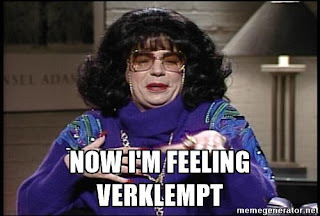 (Sorry, Vonna, but I couldn't help myself!) Congratulations on your much deserved winnings, and best of luck with your cookies. Your talents are amazing! 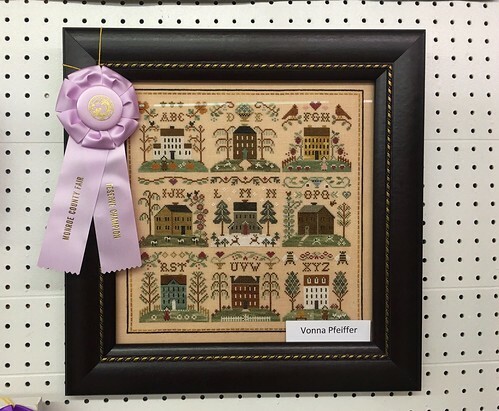 Will we see any of your cross stitch winners at the State Fair? I'll be on the lookout for them. Good for you! 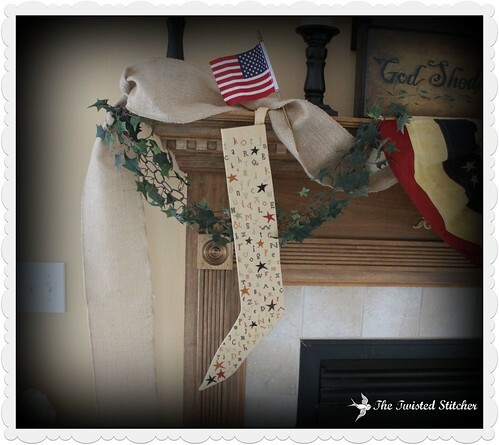 Your stitching is deserving of all those ribbons and accolades. I hope your cute cookies do just as well. well done my friend, you deserve many accolades and then some! are you sure you want that room of yours to be the patriotic room? or maybe the.... ribbon room:) so happy for you!!! Congratulations! Well earned! Can't wait to hear about those amazing cookies. I am SO happy for you. I know the time it takes to make these treasures. It's nice to see the commitment and skill rewarded. Congratulations. BTW --- the cookies are adorable. Do they taste test them too? Now, THAT'S a job I could really get into! Well done, Vonna. I know how important this was to you. So happy for you with all the ribbons. You deserve all these rewards. Congratulations! Grand Champion. Great accomplishment and once you win the first one, the others will come more easily. ;) Looking forward to your next video so you can show off all those winners. Congrats ... beautiful, beautiful work. The mermaids are adorable. Makes me wonder how one person can have so much talent. Congratulations Vonna! Your perseverance paid off. I'm sure your ribbons are all the nicer after your patience. That's great! You deserved your moment. Don't ever stop! We never know who we may inspire, or how many. You are already creating a bigger legacy than you realize. You are one of my inspirations to start stitching again. Thank you. Congratulations Vonna! You so deserved this -- your work is so beautiful. I'm really so happy for you!! Congrats again, you deserve it for all your beautiful work. Congratulations for honors well deserved. You are one of my inspirations. Keep reaching for the stars and I will follow you. Peace and Blessings for ALL. I couldn't agree with you more. I love entering items in the fair. My list is fairly long this year between Canning, Gardening, flower gardening, quilting, sewing and photography. Congratulations on your beautiful projects and the beautiful purples. Our County fair is next week and I simply cannot wait!!! 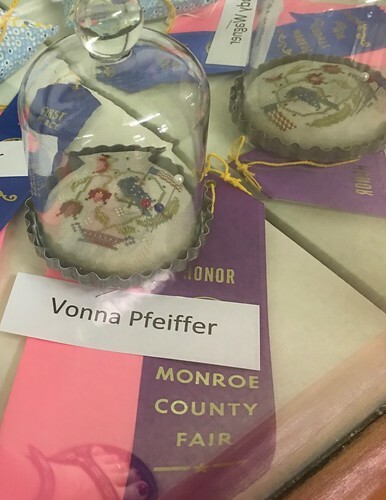 Congratulations Vonna on your fair ribbons. Well deserved. The judges finally saw the beauty and quality in your work that we have seen for years !! What a huge honor to be awarded the Grand Champion. We are all so proud of you. Yes!!!!!!! Congratulations Vonna, so, so well deserved. It's about time the judges took notice! All of your projects look wonderful. Congratulations!! That is just fantastic. You've earned all those ribbons with your hard work, dedication, and beautiful stitching. 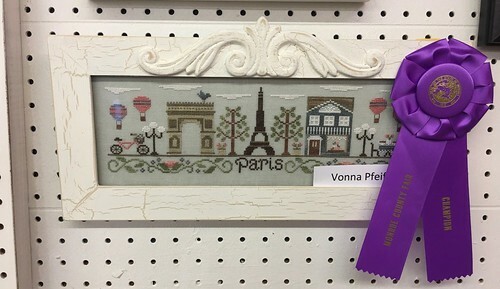 Congratulations Vonna, this whole stitching community is so proud of you!!!! Huge Congratulations, Vonna! They really do like you and deservedly so! What a great lineup of projects you entered. Stinking cute cookies, too. I bet you'll do well. 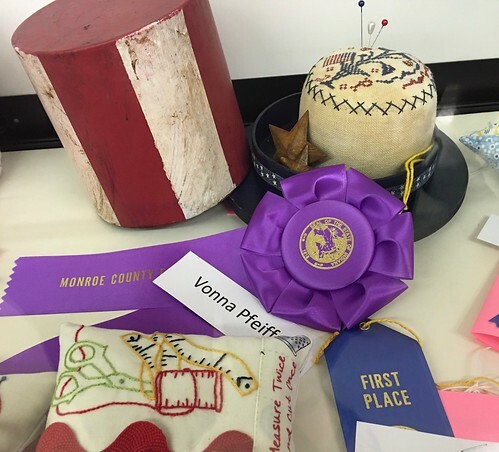 Congratulations on winning all these ribbons for your greatly stitched and finished pieces. And particularly for winning the Grand Champion of Needlearts. What a success! I spend hours stitching and quilting. I know that one day my grandkids' children will never know me and may not even care for my things. Who cares!! I love creating and will continue to do it until I can't. Your work is beautiful, and it inspires me to keep stitching. Thank you and congratulations! Congrats Vonna. It has been a long, hard road with bumps and ups and down. I hope you like the view now! My heart swells with happiness for you. I am excited to enter two things in the Fair this year. It will be my very first time!! Congratulations Vonna a big win well reserved! Congratulations ! you can be very proud of you ! all your stitches are so nice ! Woohoo! Congratulations! Grand Champion is quite the award over ALL. But you got so many ribbons and awards this year that you have every right to be celebrating!And I have seen your cookies, and they should win awards too! Do they taste them too, or just look at them overall, I wonder? Congratulations again! Your finishes are always exquisite. Congrats on your ribbons. My mom and I used to enter things into fairs so many years ago. (I also showed animals and was in 4-H.) Your cookies are adorable! Oh, I am SO HAPPY FOR YOU, VONNA!!! Each and every award is well-deserved and I know how long you've waited to bring that Grand Champion ribbon home. The spell has been broken :) I'll bet it will be the first of many. We don't have fairs around here and I would probably be too afraid to enter my stitching any way--I am not the most confident person on earth. Ha ha!! 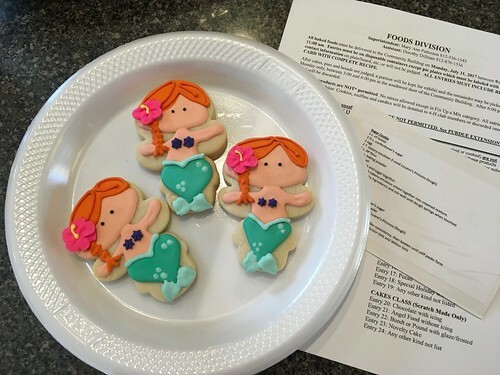 Your mermaid cookie is just so sweet--not sure my hands would be steady enough to frost something so detailed. I hope the rest of your month is just as satisfying as the past week has been! Congratulations again!!!! Congratulations! I know you deserve it! So excited for you! I know you've worked hard for this for a long time. It must make the victory even sweeter. Congratulations! Congratulations on all your well-deserved accolades! Your work is absolutely gorgeous. Your quest for perfection is so admirable and you are an inspiration to all of us! Good luck with your cookies-they are adorable! About time too! Congratulations😊, and thank you for explaining the placement system. Congratulations on all your ribbons! You've worked hard to stitch better and better, which has paid off. You are an inspiration to the rest of us. I am so pleased for you. Congratulations on all your ribbons.